On a pedestal beneath Gothic arches, Saint Anthony stands like a living statue, blessing the people and animals gathered around him. 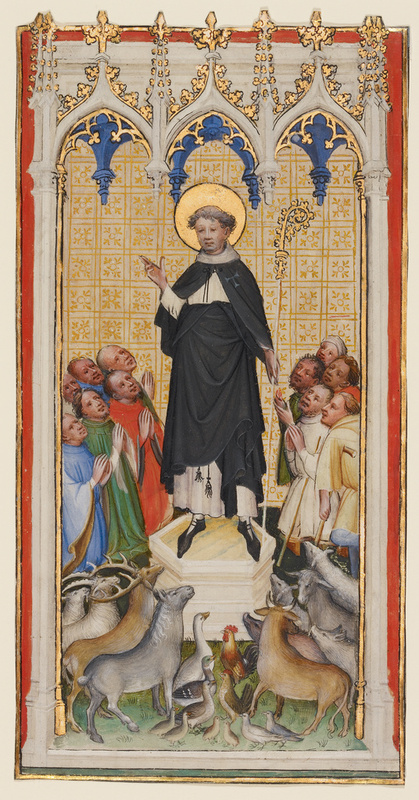 On the right, several men carrying crutches have come to be healed, while a menagerie of animals in front looks up to Anthony as if listening to his words. Saint Anthony, a hermit of the 300s, renounced his worldly goods and retired to the desert of northern Egypt. In the 1100s, the Order of Knights Hospitallers, an organization that cared for the sick across Europe, adopted him as its patron saint. Although Saint Anthony was a desert hermit, he appears here wearing the black cape with the tau cross on the left shoulder worn by the Hospitallers of the 1400s. Growing out of his association with the Hospitallers, Anthony was called on to prevent and cure disease in both people and animals, which explains the assortment of followers around him. The miniature was painted by the anonymous artist known as the Master of Saint Veronica in the International style, which is characterized by bright jewel-like colors, detailed elaborate costumes, linearity, and melancholic expressions. The animals' naturalism demonstrates the artist's interest in the careful observation of nature.